Great tenors come in threes. But no one brings in good 'ole fashioned national Irish charm quite like The Irish Tenors. This loveable trio has been all around the world stirring emotions and touching the hearts of audiences from all walks of life. With their Billboard chart-topping hits and best-selling albums, they won the hearts of a multitude of fans who get enthralled each time they get onstage and perform. 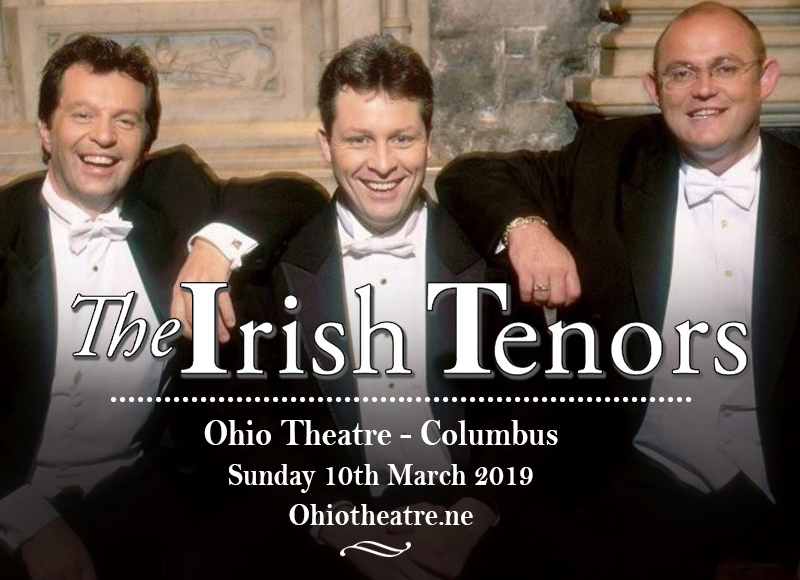 The Irish Tenors have traveled far and wide, but they're swinging by the Ohio Theatre – Columbus for a one-night-only engagement on Sunday 10th March 2019. It's good to have a quiet and cozy relaxing night enjoying their music, but it's grand to take the rest of the gang with you –family, friends, loved ones, workmates, and even those with complicated relationships statuses would find this show an amusing treat. Book your tickets early on and save the best seats where you could experience an enchanting evening that only The Irish Tenors could deliver. Inspired by the popularity of the Three Tenors in the 1990s, Daniel Harte and Bill Hughes put their heads together with the idea of forming a trio of Irish tenors during the Cannes film festival, for the purpose of producing a television special. In 1999, The Irish Tenors: Live in Dublin debuted on PBS television in the United States. This PBS special catapulted them to international fame. PBS signed them on for yet another special, dubbed as "The Irish Tenors: Live in Belfast which aired in 2000. With their natural Irish charm and superb vocal talent, they' have breathed new life in both traditional and contemporary songs which include “My Heart Will Go On” (from Titanic), “Fairytale Of New York”(previously recorded by Kirsty MacColl and The Pogues) and even Jimmy Kennedy’s “South Of The Border (Down Mexico Way)”. Their repertoire also includes “Danny Boy,” “Whiskey in the Jar” and “Fields Of Athenry”. Their album ‘Heritage’ is a certified bestseller and is said to be top rank among fans and critics as one of their finest with classic recordings of many of the most beautiful Irish songs. Their Christmas tour is a consistent crowd drawer where audiences are in awe each time they render songs from ‘We Three Kings’, their best selling Christmas Album. It features classic and timeless Christmas gems which they also perform year in and year out in their Christmas specials and tours, making it a family tradition that adds a special sparkle to family holiday celebrations. Composed of Finbar Wright, Anthony Kearns, and Ronan Tynan, the Irish Tenors' milestones include 5 specials, 8 bestselling albums, the mega hit selling CD and DVD "Ellis Island", plus countless sold out shows in major music venues like Radio City Music Hall, Sydney Opera House, Carnegie Hall, The Hollywood Bowl, and major concert halls throughout the world.